Billy Johnson Playground, one of Central Park’s most beloved play spaces, is now open! 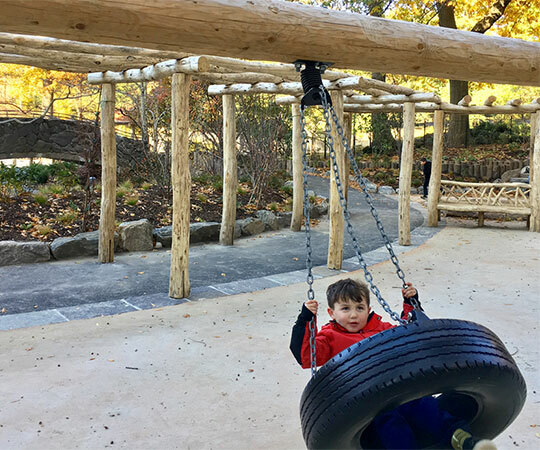 Located on the east side of the Park at 67th Street, the playground’s distinct rustic style and unique features make it a favorite destination for kids in Central Park. Billy Johnson Playground was originally designed in the 1980s by pioneering landscape architect M. Paul Friedberg. Friedberg created New York City’s first adventure-style playground in 1965, and is known for creating custom, site-specific play environments that encourage exploration and imaginative play. 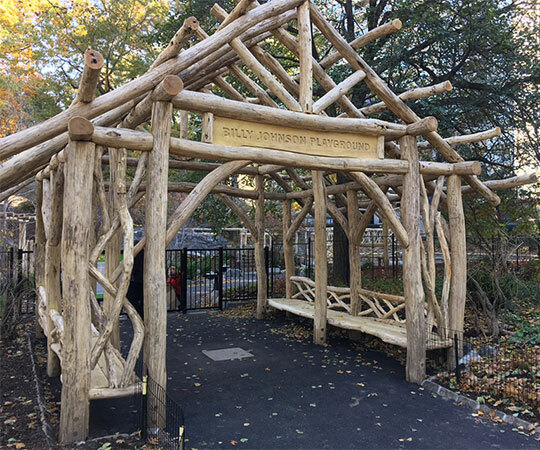 With inspiration from the landscapes of Central Park, Friedberg integrated the Park’s rustic features into the playground’s design, incorporating a wooden shelter (reminiscent of the summerhouse nearby in the Dene), plantings and trails, and a kid-size version of Gapstow Bridge. Over the past few months, the Conservancy has been renovating the space to replace play elements that were lost over time and add new features. Today, visitors will find their favorite play areas, along with brand new elements that will enhance their experience. The Conservancy revamped the entrance to Billy Johnson Playground, located on the east side of the Park at 67th Street. 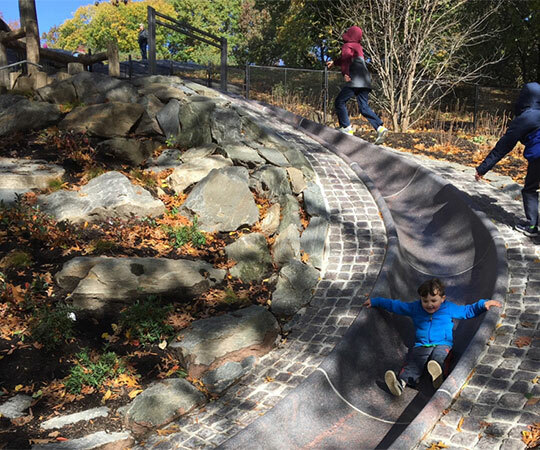 The playground’s most popular feature — and perhaps the most beloved of any Central Park playground — is the 45-foot granite slide that runs along a large outcrop on the northern edge. Most days, lines of children (and some adults) form for a ride down the slide, with playground regulars carrying pieces of cardboard to sit on for added speed. As part of the renovation, the Conservancy added a second granite slide; the new, smaller slide is accessible and can accommodate younger visitors. The playground’s beloved 45-foot granite slide. The playground also features a second, smaller slide that is accessible and perfect for younger children. While swings were not part of the original design for this playground, the Conservancy added toddler bucket swings in the 1980s in response to community demand. As part of our latest work, we replaced the existing bucket swings and added a new tire swing. Visitors will also find a more extensive rustic pergola in the swing area along with benches for caregivers. The playground’s swing area, which now features a tire swing, a more extensive rustic pergola, and benches. The amphitheater of the playground was originally intended to include a water feature, but it was never implemented. Today, the amphitheater features water jets that come up from the ground, and the existing water feature near the stone bridge has also been updated to include a user-activated spray feature. Two custom-designed play features will be added to the sand area on the west side of the playground in early 2019: a play structure with net climbers, slides, and a bridge, designed in collaboration with Friedberg, and a new rustic sand table that includes a water source. The area is open for sand play while these pieces are in production. Our work on Billy Johnson Playground enhances the rustic character of the space, while improving the experience for today’s visitors. In addition to adding new play features, we also integrated more of the rustic design to the swing area and entrance of the playground, and regraded and repaved the playground and path leading to it from Fifth Avenue to make them wheelchair-accessible. For more details on our work, visit our restoration page.